The Lunar theme is a modern, sleek template that allows you to build beautiful responsive sites. Its sturdy, lightweight framework and gorgeous design is ideal for just about any type of site, whether that be a blog or a business site. The Lunar theme’s design and subtle animations, paired with its simple to use, but powerful navigation allow you to develop sites like a pro! Lunar is built on a lightweight and responsive framework that helps your site to both look and work great on both desktop and mobile devices. Designed with style and functionality in mind, Lunar has an extensive set of options that allows you to customize its look and feel for each site you create. Lunar allows you to adjust the width of various sections of your site’s pages, independent of one another. Easily create unique layouts using differing widths for your main content, footer, banner and more. Included in RapidWeaver 7+ is the ability to easily drag-and-drop your own custom banners right into the site settings, or page inspector, making customizing your pages easier than ever! Choosing a look and feel for your site often starts with selecting colors that fit your brand and stand out. Lunar has a large selection of color pickers to help you easily customize your site. Building sites that display on both desktop computers and mobile devices is essential nowadays. 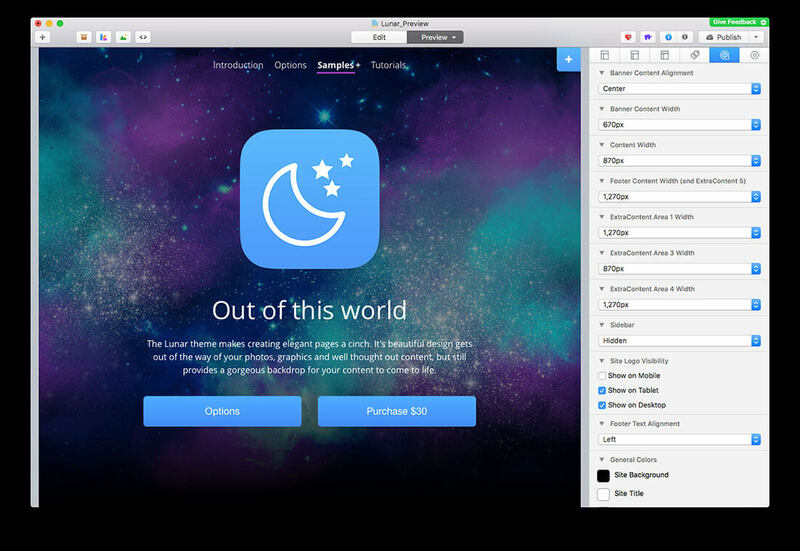 Lunar is built on a lightweight framework that ensures your site will look good on both! We've included 4 different ExtraContent areas in the Lunar theme to make building unique layouts a breeze. We've even included one in the Banner for building stunning designs. These are but a very few of the many options found in the Lunar theme. Check out the theme’s main product page, as well as to have a look through the rest of this preview site to see some of the possibilities of this theme. We offer a variety of videos, as well as an in-depth look at Lunar’s theme options. Lunar comes with 4 different ExtraContent areas. One of those allows you to add content to the footer section, as we've done here with this simple footer example.